I have owned this truck for two months now and wanted it low since well before I owned it but I wanted to take my time and do it right. I have fought the temptation to get the 4 inch block kit every time I went to O'Reilly's, so yesterday when I came home from the junk yard with my 4x4 leafs I couldn't wait to get started. I had assumed that I would be able to find the energy suspension leaf kit locally. However after tearing one side apart I decided that that would be a good time to call around to find my bushings. I now realize how foolish it was of me to assume anyone local would stock this kit. auto zone will have it in Tuesday or Wednesday. until then I will take my time dissembling the other side and mocking everything up. My goal is to eventually turbo my truck. Before I do that I want to lower it a little. The problem is that I don't want to take the risk of fabing a 3 or 4 link setup but I need a decent performing rear suspension. I by no means need race car performance but around 3-4 inches lower with stock or stiffer spring rates is what Ii would like. Several people around the forum seem to do Ok performance wise on leafs. I have come to the conclusion that new poly bushings along with 4wd leaf springs will give me what I want, stiffer rate along and a lower ride at an unbeatable price. other options I have considered are 4 inch blocks, beltech leafs or de-arched stock springs. I have ruled out blocks because I feel like the blocks will give more leverage to the axle, exaggerating axle wrap and wheel hop. I have ruled out drop leafs due to higher price and rumored lower than stock spring rate. Beltechs are my second choice if the 4wd leafs don't work out. 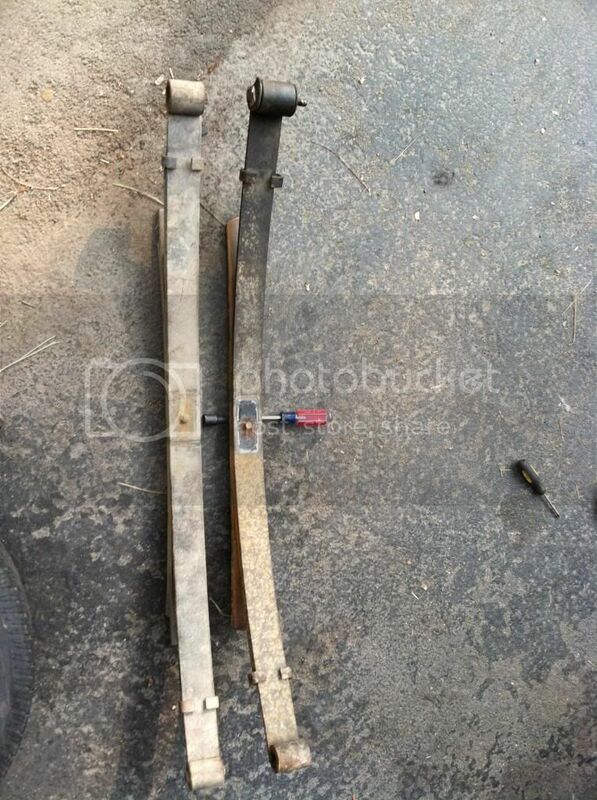 I haven't found any places locally that advertise re-arching of leaf springs. There are two problems with 4wd leafs. 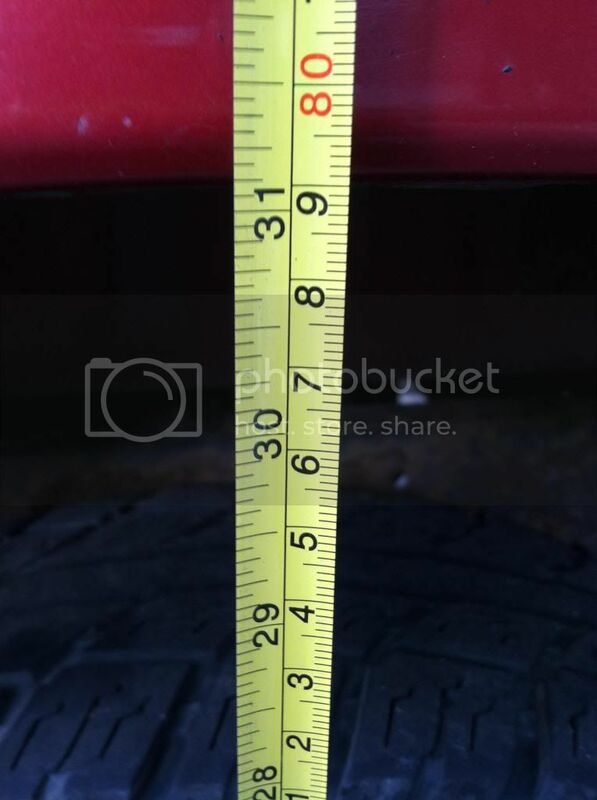 First, they are about an inch and a half longer than 2wd leafs and they have the center pin about 11/16 of an inch further toward the front of the vehicle. I will re drill the hanger further up and toward the cab, this will negate some of the extra length and the shackle will have to make up the rest. 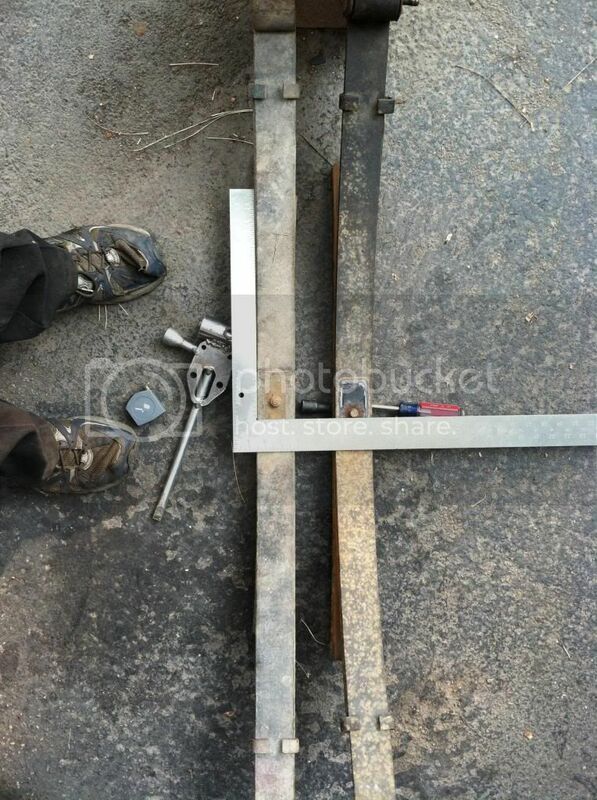 I then plan on drilling a new hole in the spring perch and u-bolt plate further toward the cab making up for the new location of the center pin, Keeping ma axle in the correct location. I may also move one of the overload leafs to the top of the pack lowering my truck an extra inch or so by de-arching the pack. This will leave one overload at the bottom and increase my initial spring rate. most likely I will try the packs as they came, but I may need mor low so we will see. The leafs in this picture are backed up against a cinder block and are complacently parallel. this picture shows the different center pin locations. Still totally parallel and butted up to the cinder block with a difference of 11/16". I now realize that the nut on the pin is about 1/16" larger in diameter than the pin side of the pin so to be totally fair the difference may be closer to 3/4". so to do this totally right you need to drill a slightly larger hole for the nut of the pin in the spring seat and slightly smaller hole in the u-bolt plate, that is unless you flip the pin to match how it came from the factory and have the nut portion on bottom and pin portion on top. Ether way Ill post the drill bit sizes i end up using when I drill everything. Ill make sure to update after making any more progress. Looks like you are on an interesting journey. What the heck is the tire iron welded to a socket welded to a SBC fuel pump spacer thingie in the picture with your shoes? I am sure they are the same orientation, I marked them at the yard. 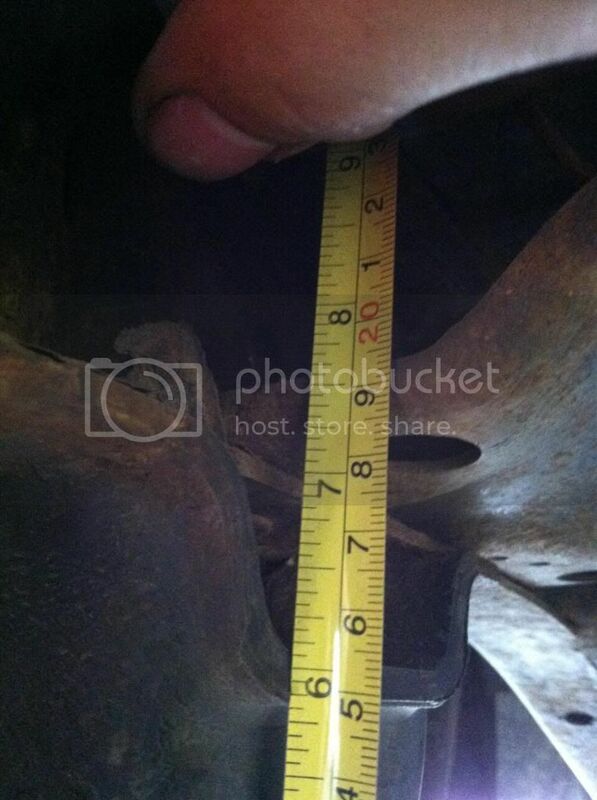 I'm assuming the bushing from the front is a different, larger size than the rear? 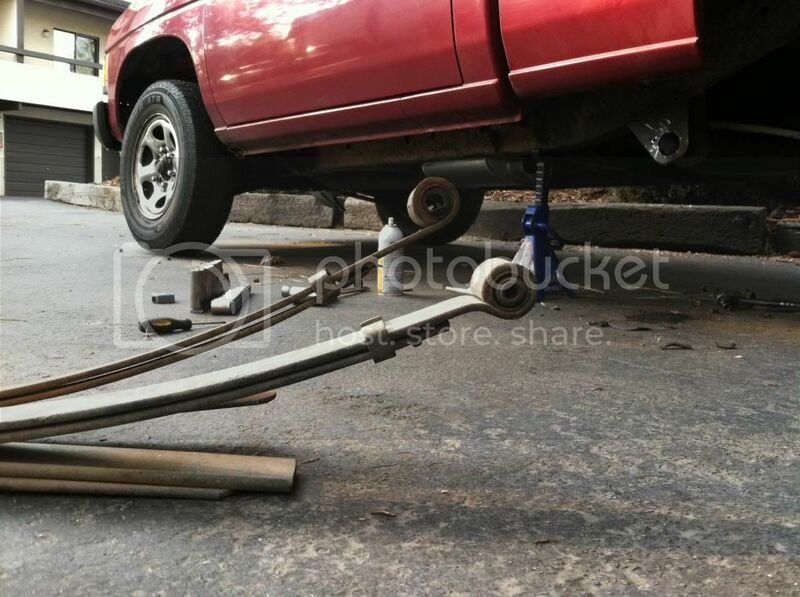 I have done a fair amount of research on different d21 rear suspension setups and have read that thread several times, however after doing measurements and a little Google research on the topic of leaf spring swaps in general I have been lead to believe i can pull this off. I knew that this had to be a problem that many other people have encountered (swapping leafs and having the center pin in the wrong location). After reading on a bunch of random 4x4 forums the most acceptable solution is to drill a new hole in spring seat and u-bolt plate given your new pin location is safely within your spring seat and u-bolt plate. worst case is for some reason it doesn't work, I end up with a couple extra holes in my rear suspension (less unsprung weight ), I have to return the 4wd leafs and try to find an set of older Beltechs or de-arch my stock packs. 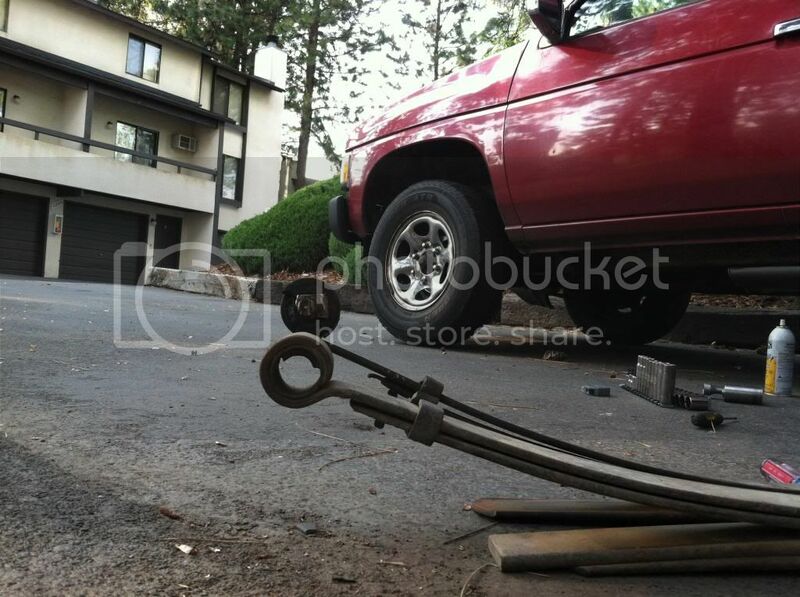 That "thing" by my foot in the picture is my trusty hammer. Its two sbc fuel pump spacers (there are hundreds of them in the scrap bin at work, I use them to make all kinds of stuff) welded to the tire iron from my last civic and a wrist pin from a 5.9 cummins as the head (also tons in scrap bin at work, though haven found many uses for them I still brought a set home just in case). No progress. I need a 5/8" and 9/16" drill bit for the center pin holes and the biggest I currently have is 1/2". Lowes wanted $14 and $17 for the bits so I passed on those. I hope there is a small shank 5/8" and 9/16" at work I can borrow. 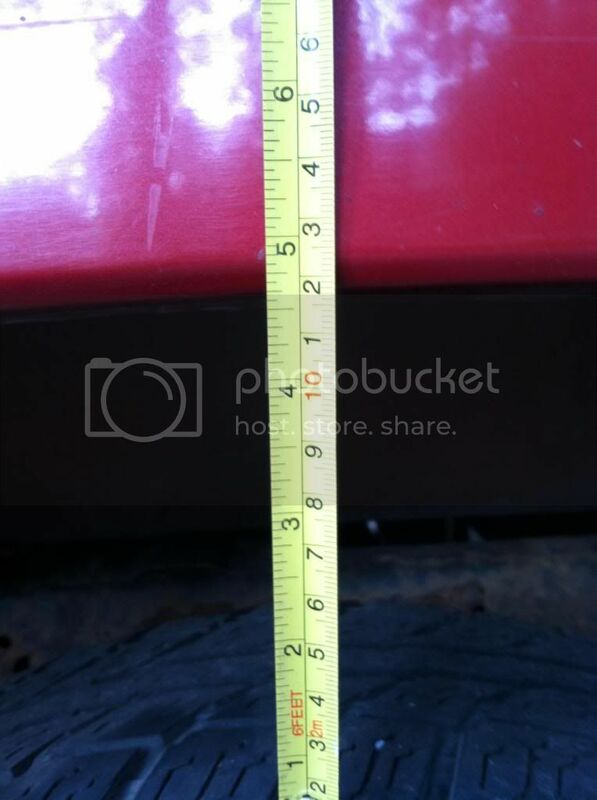 I also looked all around for a grade 8 3/4" bolt and no place in town had grade 8 that big. I might have to go to the junk yard after work tomorrow and find a couple correct size bolts from a newish not totally rusty car. Oem bolts are probably better than grade 8 and then I can keep it all metric. I really need to learn to gather all tools and parts before taking my truck apart. No - you should only have to drill a 10mm hole (or whatever Imperial drill you have that's close to 10mm). 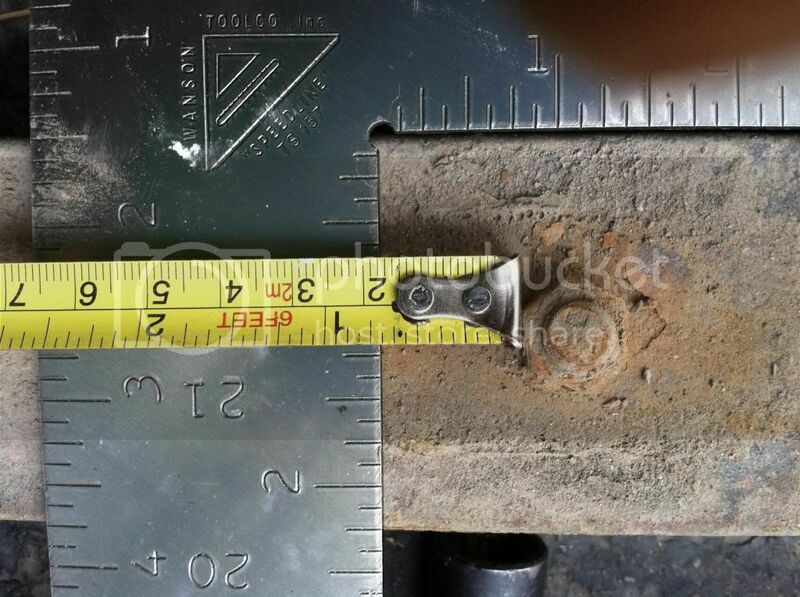 If you drill a 9/16" hole, the 9/16" fastener head will not be able to bite anything. A Class 8.8 (Metric) bolt is fine - the bolt only keeps the leaf pack together. The U-bolts do the "real" clamping. Check your local heavy truck dealers. They should have both grade 8 and 10.9 on hand in quite a few large sizes. Heavy trucks use nothing less than grade 8 on almost everything. Check your local CAT heavy implement dealer for metric bolts. The 3/4" bolt is for the hanger re drill. I'm looking for more than 3" of drop and im sure Ill need a redrill to get me close to that. I was planning on drilling a 9/16" hole in the u-bolt plate and a 5/16" hole in the spring perch on the axle. I had thought about moving the center pin on the leaf but then I thought it would be easier to drill the plate and seat, but now I am thinking that I would only need to drill a hole in the main and maybe secondary leafs and that hole would probably only need to be 7/16" or 13/32" if I can find one. I could even take the leafs to work and use the drill press. 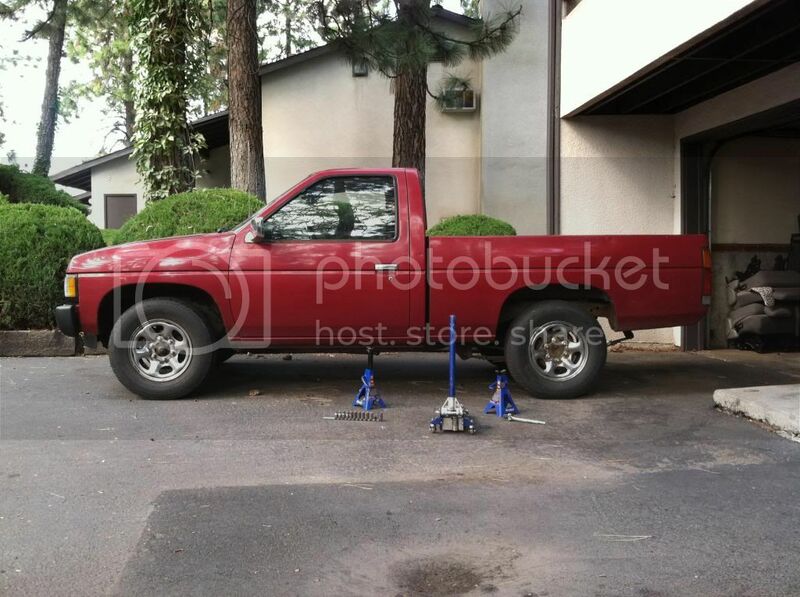 what do you guys think is better, drill top two leafs or drill spring seat and u-bolt plate? great tip on the heavy truck dealers. there is a Freightliner dealer and Komatsu Dealer on the way home. maybe I missed it, but you need to replace the center bolts. the 2wd mounts on top of the leaf and 4wd mounts on the bottom. get 2 c-clamps and tighten down on both sides of the center bolt. you can cut off the old and install the new with very little trouble.